Fallopia japonica, AKA Japanese knotweed, is a large perennial plant originally native to Eastern Asia, namely Japan, China and Korea. Sadly for those of us who have been invaded by it, it has also been remarkably successful in Europe and North America and in some places has almost achieved plague proportions. These days it is more commonly known as an unwanted, invasive non-native species. 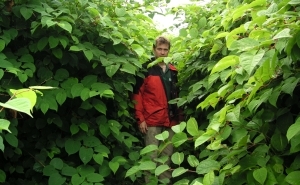 As a result Japanese knotweed removal in the UK is in great demand. The plant’s hollow stems have unmistakeable raised ‘nodes’ that make it look a lot like bamboo, but they’re not related. The stems can reach a height of 3m to 4m and you’ll usually see a host of smaller offshoots, powerful enough to sprout through concrete and tarmac. The leaves are a broad shield shape anywhere between 7–14 cm long and 5–12 cm wide, and you’ll see spikes of small cream or white flowers in the late summer. A tiny 1cm piece of knotweed rhizome can grow into a vigorous new plant in just ten days. Fragments of rhizome can lie dormant in the soil for many years; perhaps as long as two decades. New shoots can mobilise enough energy to sprout through tarmac and cause serious damage to infrastructure and buildings. If you want to preserve buildings, roads, services and other structures from expensive damage, you need to kill the roots. Digging up the rhizomes is a common solution, but it’s quite a challenge to safely dispose of every single tiny scrap without leaving any behind. If you have Japanese knotweed you might fall foul of Common Law by causing a ‘private nuisance’ to other people’s property. The plant is classified as ‘controlled waste’ in Britain, and must be disposed of accordingly. If you are using a contractor to remove the waste, they must be officially registered as a waste carrier. If you are not in any hurry, a combination of herbicides, cutting, digging and plenty of grim determination should eventually solve the problem. Studies have shown that just four cuts a year makes the plant lose vigour and reduces levels of underground biomass – although this will not actually kill the plant. You can burn Japanese knotweed waste under controlled conditions, but you need to bear local by-laws in mind. As rhizomes are typically quite wet, you’ll need to feed the fire with other materials in order to burn the knotweed. If you want to burn yours it makes sense to inform your local council first, even though you are not legally obliged to. Japanese knotweed has many local and colloquial names including fleece flower, Himalayan fleece vine, monkey weed, monkey fungus, Hancock’s curse, elephant ears, pea shooters, donkey rhubarb, sally rhubarb, Japanese bamboo, American bamboo and Mexican bamboo. Whatever you happen to call it, if it’s causing damage to your property Phlorum is heavily involved in knotweed research at University level, with many years’ experience dealing with the issues. If you have a knotty knotweed problem, we will be pleased to advise you about the latest, safest, greenest and most effective methods of removal.